This mix of interior sensibilities by Allison Elebash proves that, sometimes, rules are meant to be broken. If you can't decide whether you're more bohemian or contemporary, or whether you gravitate more toward minimalism or maximalism, then perhaps it's time to do away with labels — instead, simply go with what you love. In this instance, a clean-lined area is given dimension thanks to satisfyingly symmetrical seating upholstered in a striking black hue. Meanwhile, a natural wood coffee table introduces a rustic element, while a boho-inspired pendant light overhead counteracts that aesthetic with a whimsical, off-beat finish. It's tough not to notice that hanging art, either, which brings in colors that match the accessories and includes shapes that coincide with the roundness of the nearby leaves. And though it's not easy to call out a piece in a room that features so many different options, the credenza may be the most impactful item in the space. It coordinates with all the opposing forces, acting as a unifying center that's somewhere between conventional and rebellious. 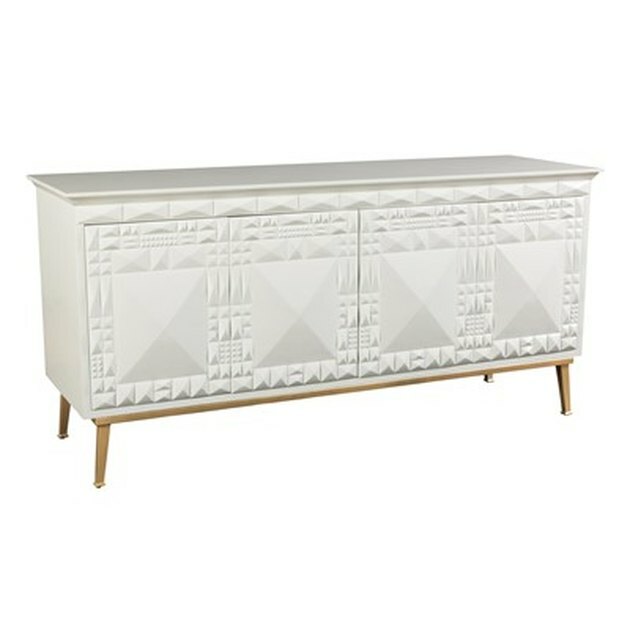 Add this credenza to any aesthetic for a dose of individualistic style.